Why have I put this project off for so long? When we bought our house about 5 years ago we put in all new flooring and baseboards and had the interior painted before we moved in. That was a really good call, being that our oldest was only a few weeks old and it gave the place a really clean slate to do some of the bigger projects we had in mind. The interior doors however got left out of the equation because at the time we thought we would just replace all of them. That was until we realized how much doors can cost and found other, more important things to spend our money on. So they sat, staring at me for 5 years with their not quite off white, more like a weird yellow, builder white color and all of the marks that come along with 10 years of living. I’d had enough, and it was time I give them a fresh coat of paint. 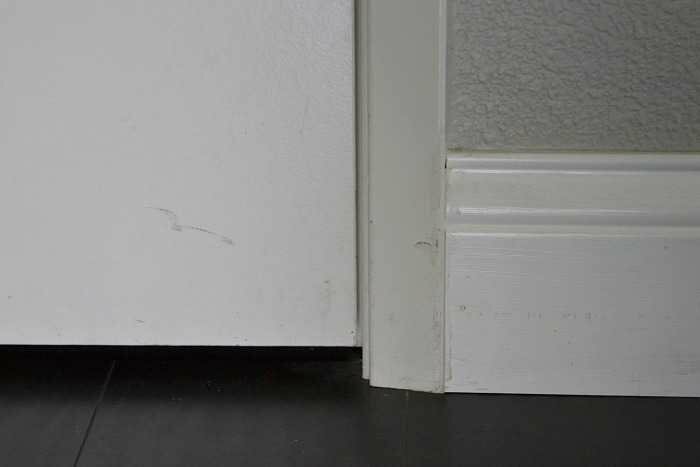 You can see that we painted the baseboards a bright white and the trim around the door and the door itself were left builder white. Not matching. And not cool. Now meet my HomeRight Finish Max. You may remember this handy tool from when I made my grandmother’s cabinet into a chic bar cabinet for our dining room. 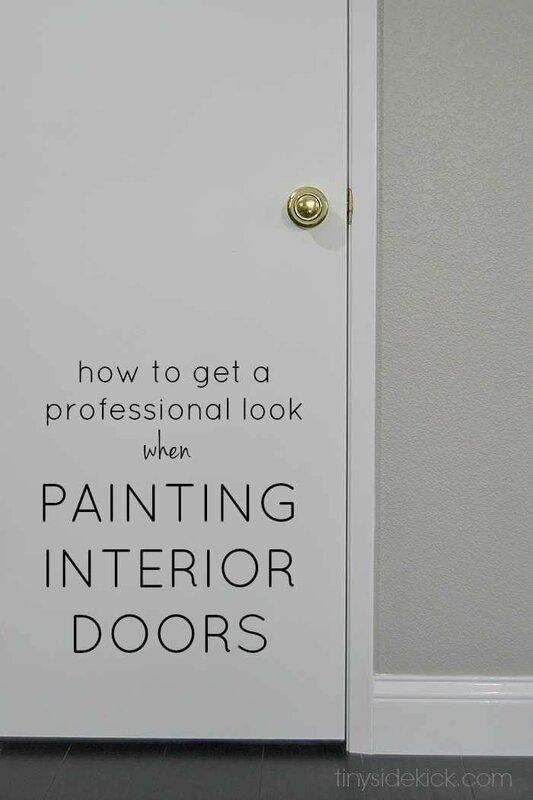 It worked so well on that project to get a really professional paint finish, so I thought it would be the perfect way to get that same professional look on my interior doors. And it did! In the end. But I have a few tips for you. 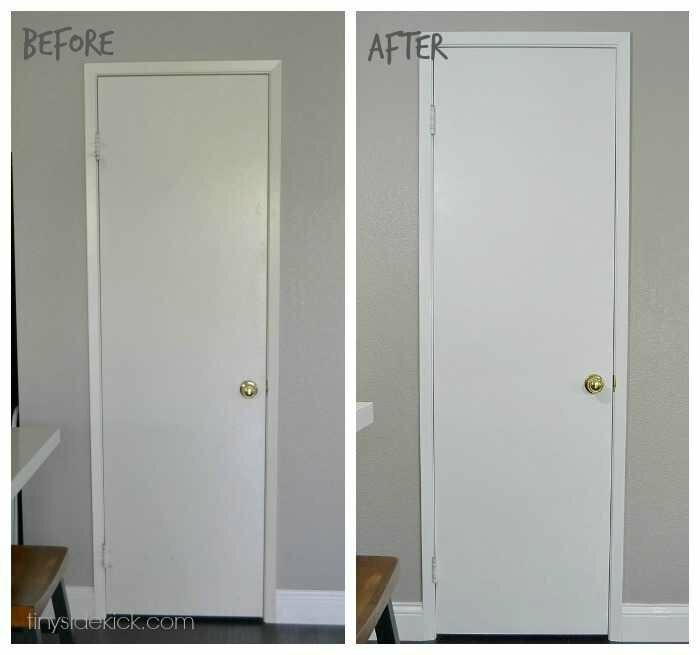 Before painting your doors, you will want to remove all of the hardware, take them off, and place them outside or in the garage with a barrier of some sort behind them. I did this by tacking a plastic sheet to the fence in my backyard. 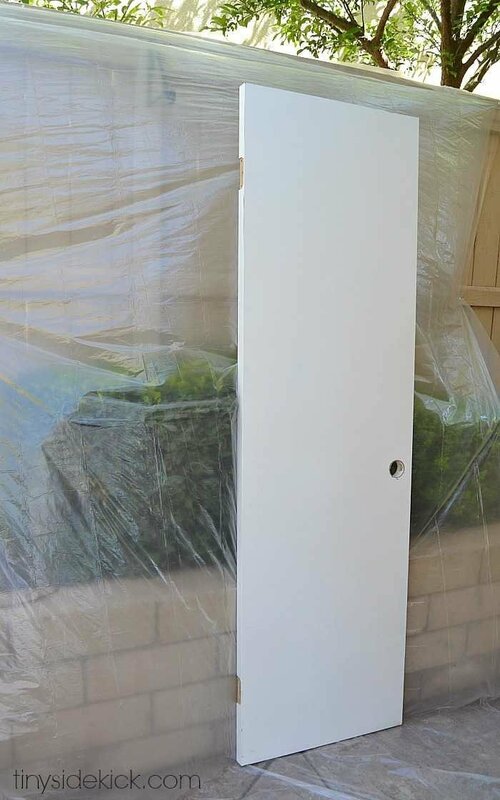 For interior doors or anything else that you want to be super wipable use a high gloss paint. Water it down exactly as the directions tell you to so that your sprayer works well and doesn’t clog up. And the biggest thing I learned… don’t hold the sprayer too close. 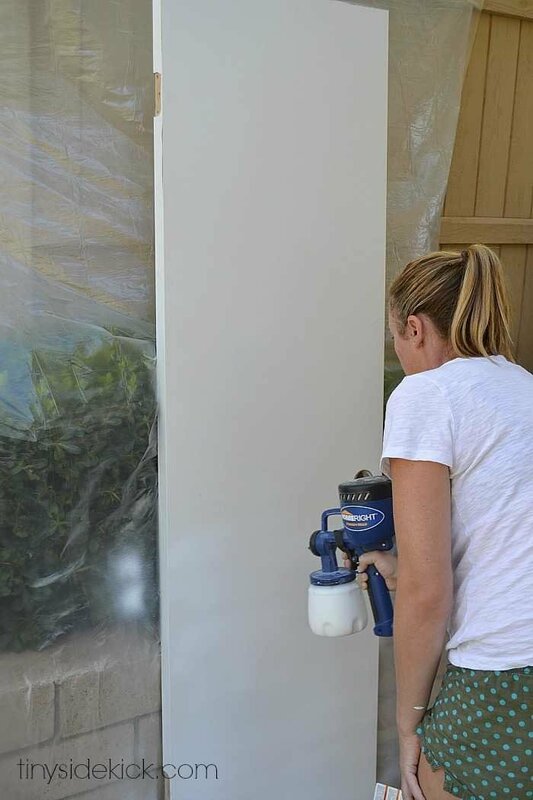 At first it seemed that the closer I held the sprayer to the surface of the door, the better coverage I got. Not true. What actually ended up happening is that I got a really streaky looking door. 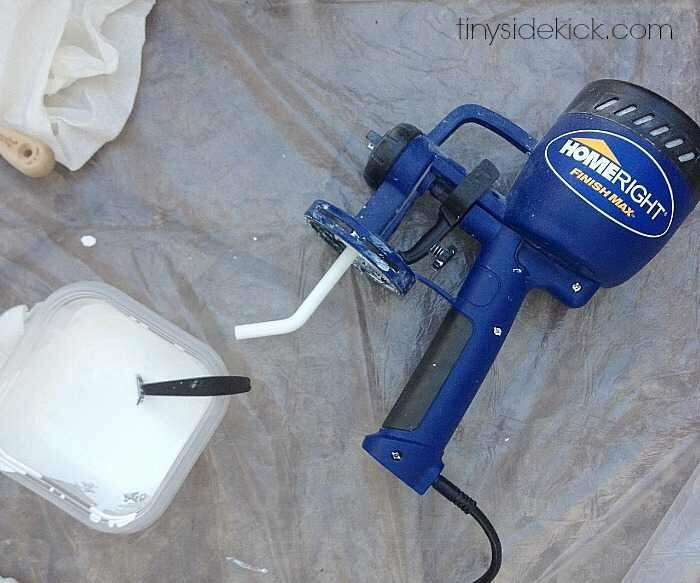 I was able to fix it easily by adding another coat with the sprayer farther away, but I could have saved myself a bit of work if I would have just done this from the beginning. The next few doors I did went much faster once I knew what I was doing. So hold the sprayer about 12 inches from your surface. Keep your sprayer moving. For each coat I used a different pattern and always kept my arm moving either in a horizontal line, vertical line, or even in a small circle pattern to get really even coverage. 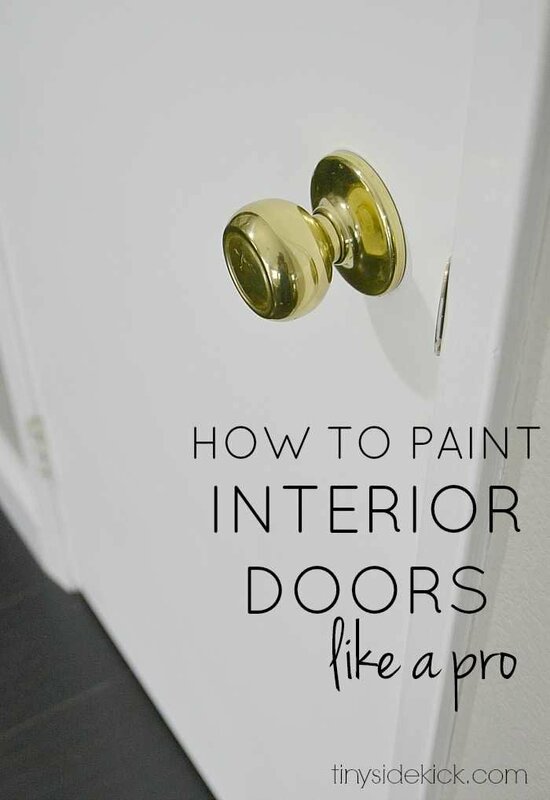 Also be sure to go a bit past the edge of the door when changing direction so that you don’t get a thick dose of paint at the edge. If you happen to get a few drips, just sand and respray. No biggie. What once was scuffed and yellow and not matching, is now bright and clean and can be easily wiped down when fingerprints to appear. I’m super happy with the result and the next set of doors I paint with the Finish Max will be the upstairs ones! To purchase a HomeRight Finish Max for your next project visit Amazon or HomeDepot. A big THANK YOU to HomeRight for sponsoring this post! This post contains affiliate links. My positive recommendation that the HomeRight Fininsh Max will help you get a really professional look is 100% my own. You can read my full disclosure here. Here is a simple discussion about oil vs latex (water based) point that should help you, Theresa. Good luck with your project! House built in 1910? Be careful of lead based paint. do not disturb if uncertain! Thanks for sharing this great tips. I am officially chalk painting some ugly old wood furniture in my house! Thanks! I would love to get a sprayer. It would make projects so much easier and professional looking. It really is one of my favorite things! They carry them at Home Depot and Amazon is always a great place to look too. Hi Megan. Yes. My parents used it to spray their front door and it has panels and it looks really good. Maybe you told us somewhere else, but I’d like to know the name of your glossy “bright white”. I’m still confused by all the “whites” out there! I have the same sprayer but sometimes have trouble getting the water/paint ratio right even with the little “viscosity cup” it came with. How much water did you add? Hi Diane. I use the “viscosity cup” and then add a little bit more water. It seems to work better with just a little extra. Looks great Corey, I think I’m sold on the sprayer! Have you thought of painting the brass knobs and lock thingymajigs in your home with ORB? Makes a world of difference. I painted ALL of mine in my home about a year ago (with Rustoleum) and they look fantastic! Just a thought. Love reading your posts!! Hi Nanette! That is definitely on my list of projects! I want to be able to do them all at once, so it’s just a matter of getting the supplies and taking off all of the knobs to do the project. So glad to hear that it worked so well for you! What a complete makeover. How long did this take? It took about 1/2 an hour per door plus dry time. I have the opposite problem. 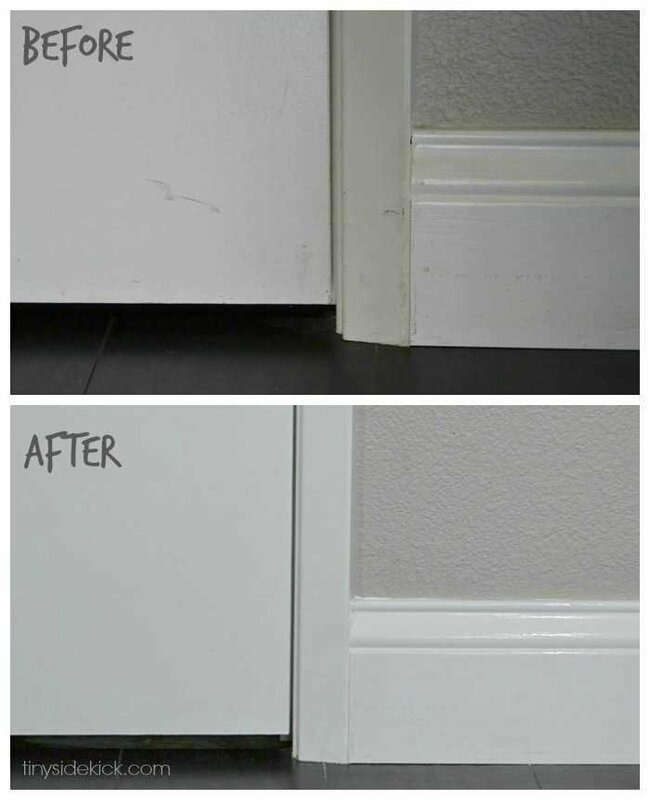 The doors were painted white over beautiful hardwood. The trim and doors are all white. This house was built in 1910. My dream. It was modernized but in a good way. But I want the wood not paint. Any tricks you may know? I have actually peeled off some of the white on the backs of the doors, that’s how I know. It is even a good idea to take it back to the wood? I just know I do not like the white. It is! I had overlooked the dingyness (is that a word?) for so long, but once they were clean and fresh it made such a huge difference!